Columbus Museum of Art Photo Hunt Challenges are Back! Our Photo Hunt Challenges are back! CMA Photo Hunts are a digital complement to CMA collections and exhibitions, give participants an opportunity to flex their creativity, be inspired by works or themes in Columbus Museum of Art exhibitions or collections, and respond to creative challenges leveraging the power of social media and the smart phone. For this assignment you have until Monday November 7, 2016. Please note: images must be your own. Anyone in the world can participate. Images can be taken with any kind of camera. Drew Sawyer, our new William J. and Sarah Ross Soter Curator of Photography will select his favorites (based on the most creative entries, and ones that best represent the assignment), and your creation could become part of an online digital gallery. We’ll also be celebrating with a special MeetUp and behind the scenes tour of The Sun Placed in the Abyss on the evening of January 5, so save the date! To give you some ideas to get you started, here are two artists from The Sun Placed in the Abyss who have reimagined the classic sun shot in different ways. As a subject the sunset not only contains the suggestion of mortality, but also implies some other, invisible place beyond the horizon. For Lisa Oppenheim’s “The Sun is Always Setting Somewhere Else,” (above) Oppenheim printed out images from Flickr of photos taken of sunsets by U.S. Soldiers stationed in Iraq, then held them up to the New York sunset, horizons aligned. 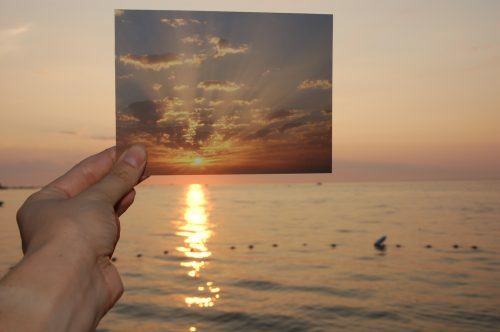 For “The Distance of a Day,” (above) by David Horvitz, the artist journeyed halfway around the world to the exact location, in the Maldives, where he could see the sunrise at the same moment that his mother was watching the sunset in California. 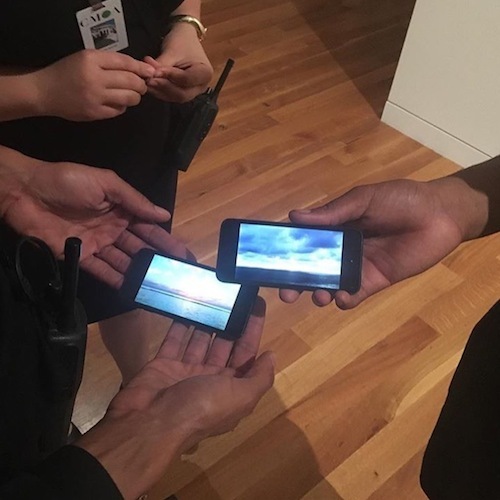 Recorded and presented on two cellphones, Horvitz’s work is a poetic image of the measurement that separates two people in time. Our ongoing Photo Hunt project is very much about connecting, building, and supporting the talented photography community around the world. So please help spread the word about this Photo Hunt challenge, and give a shout out to photographers whose work you admire.